Zip up wetsuit style stubby holder which fits most stubby size bottles. 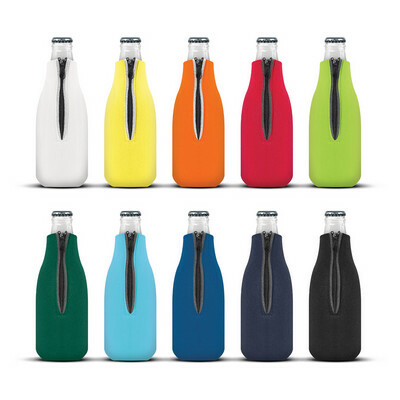 Manufactured from laminated open cell foam material which has powerful insulation properties to keep drinks cool as well as preventing cold wet hands when holding chilled bottles. Supplied flat packed for economical transportation and storage. Colours: White, Yellow, Orange, Red, Bright Green, Dark Green, Light Blue, Dark Blue, Navy, Black. Dimension: H 200mm x W 108mm. Print Description: Front - 45mm x 65mm (one colour). Print Type: Screen Print. Packing: Loose Packed. 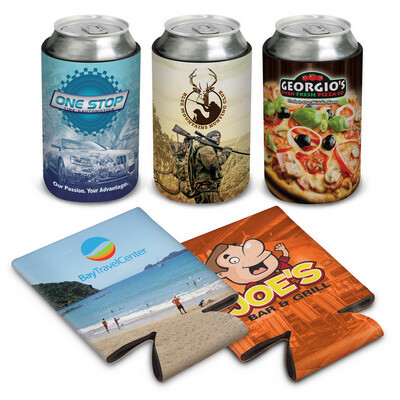 Flat pack can or stubby holder which offers branding on both sides at no extra cost. It is manufactured from laminated open cell foam material which has excellent insulation properties. A lead time of 20 working days applies to this product. Colours: Can be produced in almost any colour. Dimension: H 135mm x W 100mm x 7mm. Print Description: Please refer to template. Print Type: Sublimation Print. Packing: Loose packed. Less than minimum quantities are not available for this item. MOQ applies per colour on this item. 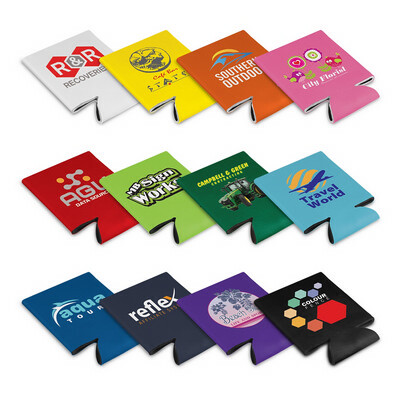 Classic stubby and can holder manufactured from 5mm genuine neoprene which will hold most stubby bottles and cans. Prevents cold, wet hands as well as keeping drinks cool for longer due to the powerful insulating properties of neoprene. Colours: White. Dimension: Dia 70mm x H 108mm. Print Description: 211mm x 110mm (plus bleed if required). Print Type: Sublimation Print. Packing: Loose packed. The seam of the stubby holder is stitched. Taping is available for a surcharge. 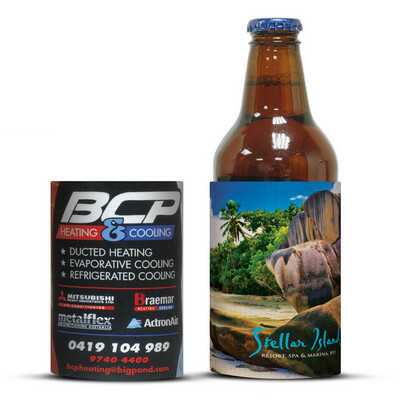 Can and stubby holder which is manufactured from a laminated open cell foam material that offers excellent insulation. Prevents cold, wet hands as well as keeping drinks cool for longer. It will fit most cans and stubby bottles and is supplied folded flat for easy distribution. Colours: White, Yellow, Orange, Pink, Red, Bright Green, Dark Green, Light Blue, Royal Blue, Navy, Purple, Black. Dimension: W 100mm x H 132mm x 8mm (flat). Print Description: 70mm x 70mm. Print Type: Screen Print. Packing: Loose packed.